Among the most difficult issues in family law is the interplay between the amount of time children spend with each parent and child support. No doubt, the more time a parent has the children, the higher the cost. Yet, where is the “breaking point” where additional time should result in a change in the child support? On one hand, to count every day would encourage placement fights where children become pawns in an economic chess game. On the other hand, to ignore the placement schedule entirely would be to ignore economic reality. Current Wisconsin child support guidelines do not recognize any financial consequences to a placement schedule until it exceeds 30% of the time with the paying parent. A second, and greater reduction, results if the placement schedule with the paying parent exceeds 40% of the time. A recent court of appeals decision addresses the issue of when a change in the placement schedule should result in a modification of child support. Unfortunately, the decision may only add confusion to the issue. In an unusual move, the court ordered the publication of Beaudoin v. Beaudoin, 2001 WI App 42, contrary to the recommendation of the District III (Wausau) panel that decided the case. In Beaudoin, James Beaudoin was ordered to pay his wife, Terry, $410 per month child support, although it is not clear how that amount was determined. Within several months of the divorce, the parties voluntarily changed the placement schedule to minimize disruption to the children’s schedule. About a year later, Terry sought an increase in the amount of child support, based on the additional amount of time she had the children. According to her motion, the divorce judgment afforded the husband 46% of the placement schedule, whereas he actually had the children only 31% of the time. The trial court found the change in the schedule to be a substantial change in circumstances and ordered an increase in child support to $679 per month. James appealed. The court of appeals began its analysis by noting that a modification in child support requires a showing of a substantial change in circumstances. The only substantial change in circumstances proved by Terry was the change in placement time. Significantly, there was no evidence introduced regarding the financial consequences to Terry of this change. The court held that “[t]he change in amount of placement days does not, in and of itself, establish a substantial change in circumstances.” 2001 WI App, 12 (citation omitted) . The court held that the reductions in support set out in the Child Support Guidelines deal with the initial setting of child support. The guidelines do not address the issue of how a change in the placement schedule would affect child support. Therefore, the court held that Terry must establish not only that there was a change in the placement schedule, but she must also prove the financial consequences of this change. While the court is quite correct that the guidelines do not specifically deal with the issue of a substantial change in circumstances, there is no logical reason why the financial consequences of the placement schedule should mean more at the time of the divorce than they do at a later date. Why should one parent with the children 31% of the time pay less child support than a similarly-situated parent with the children 31% of the time, if the only difference is when the placement schedule went into effect? On the other hand, as stated earlier, tying placement schedules into child support is necessary, but dangerous. If any change is sufficient to modify child support, then the maneuvering over placement which occurs pre-judgement can continue post-judgment, with the result that the children get no respite from a continuous struggle. 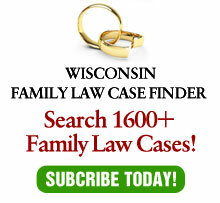 In the near future, the legislature will be considering proposals to modify Wisconsin’s child support guidelines. Included in these proposals will be modifications to when and how the placement schedule should result in a change in child support. There is no easy — and perhaps, no good — answer. All of the proposals under consideration thus far, however, deal only with the initial setting of child support. Hopefully, the legislature will consider the issues raised in Beaudin and address the legal standard for modification of child support when the placement schedule changes.